Things are changing rapidly at both the local level and the state level. Those changes will soon begin to impact what materials will be allowed to be used by restaurant operators for to go orders. This is one of the times that you want to be ahead of the curve on designing a comprehensive paper goods and to go packaging plan for your restaurant. Many operators truly wanted to go with fully compostable, eco-friendly paper goods many years ago but soon found out that a commitment to those types of materials was cost prohibitive. There is certainly a marketing advantage to a large segment of restaurant guests knowing that the operator is using eco-friendly materials and practices, but like with any other statements of quality, the operator must do a good job of making sure the guest knows this. California passed the first statewide ban on single-use plastic bags back in 2016. At the time, restaurant and department stores were not included in the ban but recently there have been many attempts by the state legislative bodies to include both in the ban. The charge for paper bags and thicker plastic bags of ten ($0.10) cents is mandated in the law. California voters approved the ban with the passage of Proposition 67, Senate Bill 270. SB 168 (Wieckowski, Democrat-Fremont); Minimum Recycled Content – would require Calrecycle to establish minimum recycled content standards for beverage containers. Most of the recycled beverage (think water bottles) containers in California are actually sent out of state or oversees for recycling. AB 2379 (Bloom, Democrat-Santa Monica); Plastic Microfiber Pollution – would require labels of notification of clothing that contains synthetic fibers which contribute to marine plastic pollution. SB 1335 (Allen, Democrat-Santa Monica); Sustainable Food Packaging – this bill would ensure California meets its waste diversion goals by requiring all disposable food packaging provided at food services facilities is recyclable or compostable. Currently, this bill is aimed at food facilities serving state agencies, state facilities or operating on state property. SB 705 (Allen, Democrat-Santa Monica); Sustainable Takeout Food Packaging – this bill would eliminate polystyrene (Styrofoam)containers statewide. This bill died on the Senate floor. AB 2779 (Stone, Democrat-Scotts Valley, and Calderon, Democrat-Whittier); Connect the Cap – this bill would require the tops of disposable plastic bottles to be connected to the bottle. This bill died on the assembly floor. AB 1884 (Calderon, Democrat-Whittier); Straws Upon Request Only – this bill would require all sit-down restaurants in California to forgo automatic distribution of plastic straws in served drinks and only provide as requested from the guest. So, you can see the type of activity that is currently coming up on a continuous basis in the legislative bodies in California, eventually, these will find a way through to law, which will restrict the use of these types of materials. There are great opportunities for developing, as paper suppliers start to provide new compostable and recyclable containers, cups and straws. Berkeley Straw Ban – prohibits the use of plastic straws in all bars, restaurants and coffee shops. Concord Polystyrene – ordinance to ban all polystyrene food packaging from food and beverage outlets. Long Beach Polystyrene and Plastic Straw Ban – ban use of polystyrene containers and limit the use of plastic straws. San Francisco County Disposable Food Ware – a proposed ban on all disposable cups and straws including compostable, recyclable or otherwise at dine-in food establishments. Los Angeles County Polystyrene Ban – bans all polystyrene from use in all food service establishments in all unincorporated areas of the county. As these measures start to take hold, operators should be working on a strategy for their operations to start to move to materials that will inevitably become needed. 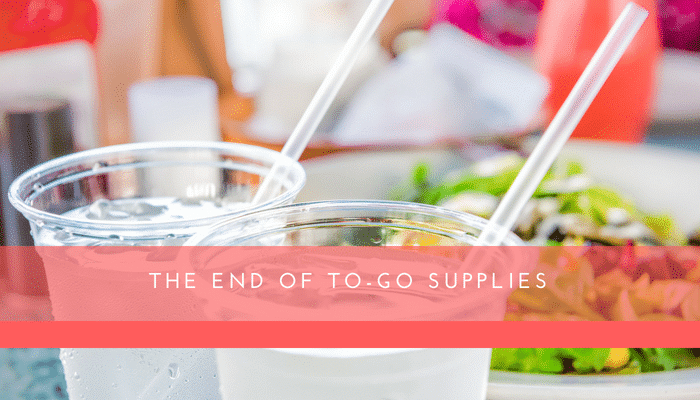 Planning out which containers, straws, and cups you will want to move to based on your current purchasing needs is essential. We recently attended the National Restaurant Show in Chicago and there are many products that can fit any operators needs. Lastly, the current increase in oil and gas prices are also factors in the cost of paper products. Increased oil and gas prices translate to increased expense of recycling and a general increase in manufacturing costs of these products. These cost increases will show up in the deliverable price to the operator. Plastics are derived from byproducts of oil and gas refining, as well as natural gas processing, so the price of those plastic straws and cups are about to get more expensive too! If you have questions about the impending law changes and/or need assistance with an evaluation or planning, please contact us. We’re here to help guide you through these changes and makes sure you and your restaurant business are ahead of the changes, to ensure your operation can continue to run smoothly.